This article actually was initiated by Osama Anis, living for more than 12 years in Sharm. Osama Anis and his wife Sophia Nicola are in preparation of the engagement of their daughter Theresa to Amgad Adel, which is going to take place on November 2, 2006. Let us all congratulate the bride and groom and wish them all the best. You may think that an Egyptian wedding is like any other wedding, but I can assure you that an Egyptian wedding is a very special historic ceremony. It is the most important ceremony for Egyptian girls. I am sure there are certain rituals for marriage in many parts of the world but the Egyptian wedding ceremony has been carried on from generation to generation since the times of the Pharaohs. While there are many western aspects, the enthusiasm and grand festive atmosphere of an Egyptian wedding is simply amazing. The ancient Egyptians were the first civilization to regard marriage as a legal relationship. Many of the old marriage contracts have been found, and they were registered and signed by three officers. The ancient Egyptian laws gave the right of divorce to women as well as men, and the wife had great respect and a high degree of prestige. Before marriage in ancient Egypt, there were many chances for men and women to meet in places such as the temples or at the common feasts. There was a custom in the Egyptian family which allowed the adult daughter to welcome guests who came to visit her parents. Even today there remains in some parts of rural Egypt a custom that the eldest daughter is to marry before the youngest. The ancient Egyptians had an engagement period in order for the couple to become familiar with each other. The groom-to-be and his parents would go to the bride’s house and meet the head of the family. They would negotiate an agreement where the groom would pay a dowry, called Mahr, and buy the bride a gift of precious stones or gold, called Shabka. The value of this gift depended on the financial and social levels of the suitor”s family. When the two parties completed the agreement, they fixed an date for the engagement party. Relatives and friends attended the party in one of the common banquet halls, which was decorated with several kinds of flowers and lights. The fiancee wore the engagement dress which was simpler than the wedding dress and its color was blue or pink while the groom put on the finger of his fiancee a ring, the ancient Egyptians gift to the old and new world,which was a symbol of immortality. 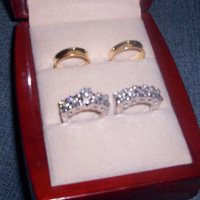 In addition, the groom gave his fiancee the valuable jewelry gift agreed on before. During the party, the attendands ate and drank several kinds of food and drinks. When the house of the new family became ready, the two families fixed the date of the wedding party. The night before wedding day, the relatives, the friends and the neighbors got together to celebrate “the Henna Night”. The women went to the bride’s house, while the men went to the groom’s house. At the bride’s house the women danced and sang all night while the bride wore a pink dress made with silk or cotton fibers, and her hands and feet were bleached with henna. Meanwhile, the men danced and sang all night at the groom’s house, and the groom wore an expensive suit. The next day, the marriage contract was signed and registered by the priest in the temple in the attendance of the couple and most of their families and friends. After sun set, the wedding party started, and the couple wore their best dresses and jewelry. The bride was transferred to her new house on a horse or a camel with a musical band, and the guests sprayed the cortege with green wheat as a symbol of fertility. Several kinds of cooked meats as well as vegetables and fruit were prepared for the guests, who danced and sang with music all night. In the morning, the wife’s mother and her sisters visited her and gave her some food. The wife’s friends and relatives visited her after seven days from the date of her wedding party, and they offered gifts and some food, while she gave them some sweets and fruits. Ancient Egyptian marriage customs are the most effective marriage customs in Egypt’s history although Egypt has been exposed to many civilizations, such as, Greek, Roman and Islam. While time has altered modern Egyptian weddings, many of the traditions remain. Christian and Islamic custom now dictates that the official wedding must take place in a church or mosque. However, the engagement agreement between the families still includes the two main items: the “mahr” and “shabka”; furthermore, the engagement party is quite similar to the engagement party in Ancient Egypt. Reception parties differ from place to place in Egypt but they all hold common features including singing, dancing, a banquet and a lot of guests. Most often the wealth of the family of the bride and groom dictates the number of guests invited to the reception. However, the engagement period has become longer because of the preparation of the new house”; it is costly and often does not suit the income of the couple or the income of their parents. The marriage contract is signed and registered by maazoon for muslims, a man who has an official license to sign and register the marriage contract, and by the priest for the Christians, in attendance of the couple and their families and friends. For Muslims this procedure happens in the bride’s house or at a mosque and for the christians in church. Certain aspects of Egyptian weddings in urban cities are not unlike weddings anywhere in the the world. The bride wears an ordinary bridal dress and the groom a black suit or a tuxedo. The ceremony starts with a car parade. The wedding car (as prestigious as possible) will be decorated with flowers and ribbons. Cars of both families move together in a noisy parade of continuous sounding of car horns to a wedding hall most often in a hotel. The honking is to announce that there is a wedding taking place. When the bride and groom reach the hotel they are received by a “Zaffa”. The Zaffa is another human parade of belly dancers and drummers surrounding the bride and groom, singing happy songs. The bride and groom will occasionally join in the dancing but the main aim is to walk as slowly as possible to the wedding hall. Some Zaffa’s will last an hour! When the bride and groom finally reach their destination in the hall they sit in the “Kosha”. The Kosha usually consists of two comfortable seats in front of the guests where the bride and groom reign as though king and queen. As soon as the bride and groom are seated in the Kosha a rose sherbet drink is passed to the guests and all drink to their health. Then the bride and groom will switch rings from right hand to left hand. This is probably an old Christian tradition but it is done whether the couple is Moslem or Christian. With this ritual, the festivities begin. The bride and groom have the first dance after which the other wedding guests join in. Usually a belly dancer or a singer entertains the guests but in more luxurious weddings there is more than one entertainer. Guests will dance and sing with the newly wed couple, and the groom will occasionally be tossed in the air by friends. The more the tossing of the groom the greater his popularity! After the formal entertainment, a disc jockey is used to extend the festivities. Then comes the cutting of the cake. As elsewhere in the world, the bride and groom cut the cake, which is several layers high. The bride then tosses her flower bouquet behind her back to other hopeful females. Who ever catches the bouquet is lucky because she will be next to marry. Next, the couple opens the buffet for the guests, which is usually a wide variety of salads, meats, stews, and sweets. Actually the list might go on forever in some weddings. Food is considered one of the factors that reflect the wealth of the families of the bride and groom. After every guest has “stuffed” his or her stomach, the wedding party is over. In some weddings there may be some more entertainment. Then the bride and groom usually get a complimentary night or two at the hotel. Modern urban weddings are obviously affected by western traditions. For example, the cutting of the cake and tossing of the bouquet. This is not the case with rural areas of Egypt. In rural areas, after the Zaffa, the wedding ceremony will usually take place in a big clearing of land where a huge Arabic tent called the “Sewan” is set up. Entertainment includes a belly dancer or singer and sometimes both. Drinks are passed to guests and food comes in huge plates to be served to guests. The customary food is “Fattah” which is pieces of lamb meat embedded in rice and bread dipped in stew. The bride and groom will leave the wedding early but the guests continue the festivities.